France is synonymous with luxury, and there’s hardly anything as le luxe as sipping a glass of bubbly. We’re speaking of champagne, if you hadn’t already guessed, the French product most obviously associated with luxury. Walks, one of our favorite small group tour operators, makes it easy to live out your champagne wishes and caviar dreams on a day trip to Champagne from Paris. 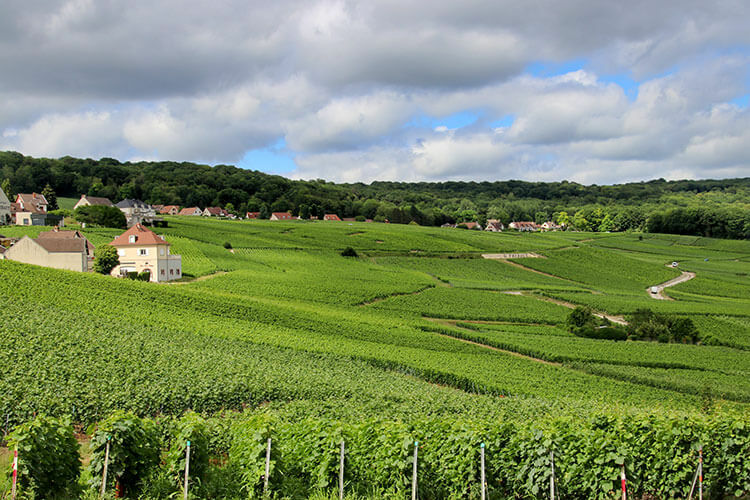 Located just a little over an hour from Paris, the French wine producing region of Champagne is an easy trip to make from the French capital and we thought it was about high time we did just that. While our years of living in Bordeaux have been like attending a mega WSET focused solely on the 62 appellations of the World Capital of Wine, we knew very little about champagne. But with Walks expert guides, we knew we’d be in for a bubbly-filled day learning all about the world’s most famous sparkling wine. Champagne is so entirely different from Bordeaux, and just about every other wine producing region of France for that matter. The grapes are grown primarily by growers in Champagne, with around 19,000 growers primarily growing the three main champagne grape varieties: Chardonnay, Pinot Noir and Pinot Meunier. Only a small fraction of growers are also champagne producers. 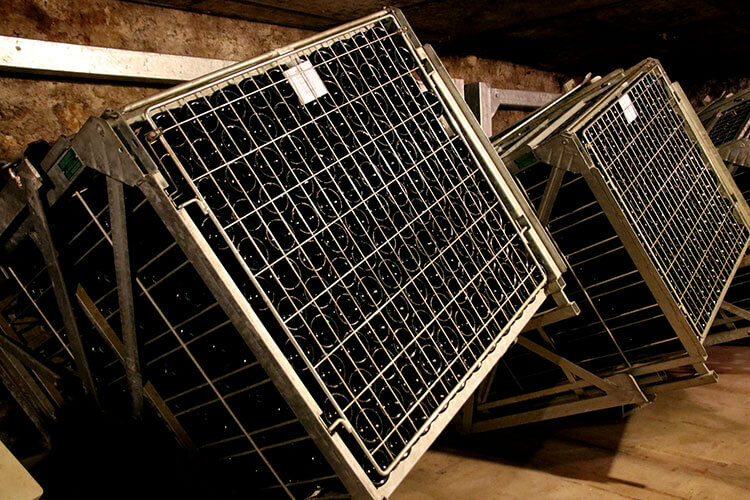 Champagne is dominated by 260 champagne houses that represent 70% of the production and 90% of the exports, and those houses source their grapes from various growers across the entire region to create their blends. Our Walks day trip from Paris to Champagne took us to the birthplace of champagne where Dom Pérignon lived and worked, before introducing us to both ends of the spectrum when it comes to champagne producers. 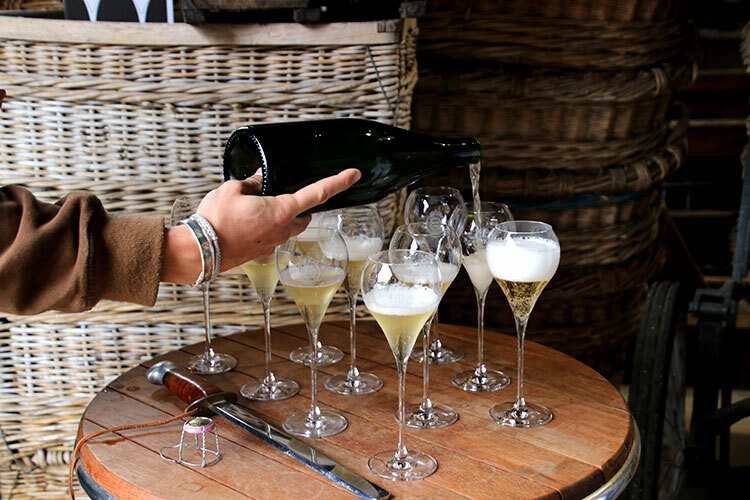 Visits to a small fifth generation family-run producer and the world’s largest champagne house were punctuated with five glasses of different champagnes, making for a fabulous jaunt outside of Paris and an excellent introduction to the world of champagne. Considered the birthplace of champagne, our Walks tour fittingly began in the village of Hautvillers. It was here that a 29 year old Dom Pérignon joined the Benedictine Abbaye Saint-Pierre d’Hautvillers in 1668 and served there as a cellar master (the person responsible for managing the cellar where wine was made, aged and stored) for the rest of his life. Dom Pérignon is often incorrectly credited with inventing sparkling wine. He wasn’t actually the inventor, though the oldest record of sparkling wine does credit the Benedictine monks with inventing it in 1531 in the Abbaye de Saint-Hilaire near Carcassonne in the south west of France. Of course, much like Bordeaux wine of that time, it wouldn’t be recognizable as champagne today. But we can say that Dom Pérignon is the father of modern day champagne, because it was his discovery of the méthode champenoise and subsequent contributions to wine making that led to the bubbly we drink today. During his 47 years as cellar master, Dom Pérignon did more than double the size of the abbey’s vineyard. He was also responsible for riddling the abbey’s extensive collection of aging bottles of sparkling wine. 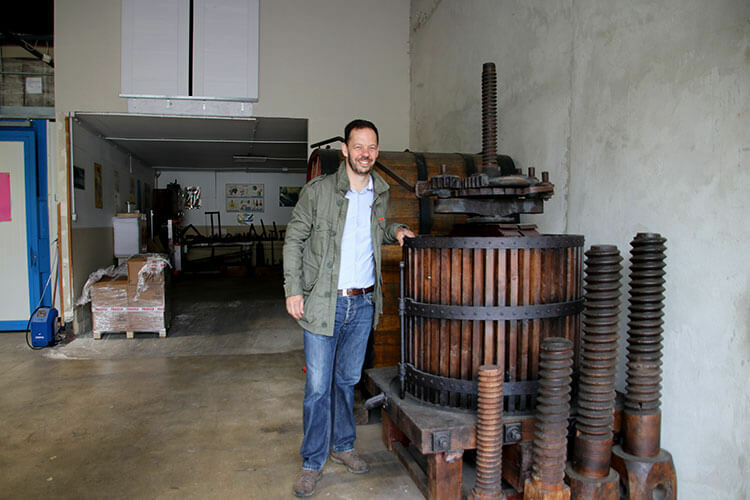 This was a process that winemakers of the time used to rid their bottles of the bubbly gases that occurred from re-fermentation in the bottles. Though we’ll never know if he ever truly uttered those famous words, what we do know to be uncontested and true is that it was Dom Pérignon that found a way to make white wine from red grapes. And it was this step, the step, that established the modern champagne making principles that are still in use to this very day. The Abbaye Saint-Pierre d’Hautvillers was originally built in 650, and was sacked and burned many times throughout its history. At the time that Dom Pérignon was the cellar master there, the abbey was a great complex of buildings. He even led a restoration project and built the Porte Saint-Hélène entrance in 1692. All that remains today is the main building, cloister and the Porte Saint-Hélène entrance. 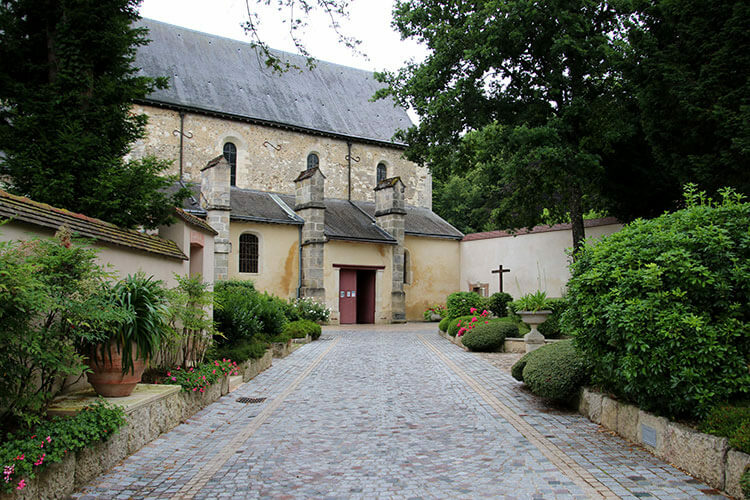 The abbey, cloister and gardens are privately owned by Moët & Chandon and can only be visited by invitation; but the church where Dom Pérignon was laid to rest is open to the public. It’s the church and Dom Pérignon’s tomb where we stood as our guide educated us on the history of champagne, and on the important contributions that earned the monk a final resting place in the abbey church. It was the Greeks and Romans that planted the original vineyards more than 2000 years ago, then the church became the predominant keeper of vineyards and producer of wines around the 5th century. As wine making became a trade, wine making skills as well as the vineyards themselves began to be handed down through families. Modern globalization and hefty inheritance and property taxes brought about the shift from family-owned to corporate owned in the 20th century. But even in Champagne, where many families no longer even have an association with the famous houses that bear their names, there’s still family-run producers to be found. That’s precisely where we’ve found ourselves for our first Champagne tasting: a family-run house in the capital of Champagne that has been operating since 1922. We picked up Cyril, 5th generation leader of Janisson-Baradon et Fils with his winemaker brother Maxence, and drove the short distance up to their 9 hectares of vineyards overlooking Épernay. This itself is quite special, since it’s rare that a grape grower is also a champagne producer. The artisan champagne producer grows all seven champagne grape varieties and uses a type of organic farming becoming more popular in the region in which the bare minimum of chemicals and pesticides are used. Back at Janisson-Baradon’s house, we got a lesson on the various producers. Identified on every bottle of champagne, there’s an abbreviation system that helps in-the-know buyers understand the type of producer that produced the champagne. Janisson-Baradon et Fils is what’s known as RM: Récoltant-Manipulant or Grower Champagne. Basically, it means that Janisson-Baradon are a farm-to-table kind of producer, doing everything from growing their own grapes to even bottling on site. It’s a tradition to open bottles of champagne with a sabre, especially on ceremonious occasions. Since the sabre was Napoleon’s calvary’s weapon of choice just after the French Revolution, his soldiers would pop open bottles of champagne with their sabres to celebrate their spectacular victories. “Champagne! In victory one deserves it; in defeat one needs it,” so famously uttered by Napoleon encouraged the bubbly fueled celebrations. Wielding a champagne sabre, our Walks guide Hugo wowed us with his sabrage skills and the bubbly was officially flowing. Champagne flutes in hand, our small group followed Cyril throughout the cellar as we learned about his production processes from beginning to end on the best of the Épernay champagne tours we went on. We saw the machines where sorting and pressing take place, the various types of tanks Janisson-Baradon has experimented with in their nearly 100 years of producing champagne, the barrels where the wine ages before bottling, ancient and modern riddling processes, and how the dead yeasts are removed. We finished off the visit to Janisson-Baradon et Fils by heading to their boutique right in the center of Épernay for a tasting of three different Champagnes from the range they produce. We tried the Blanc de Blancs Grand Cru made from 100% Chardonnay, Brut Nature which is a 50/50 blend of Pinot Noir and Chardonnay but has no sugar added, and Brut Rosé which is a blend of Pinot Noir, Chardonnay and Meunier. All were delicious, but if we had to select a favorite the Brut Rosé wins in our book. It was one of the best rose champagne we’ve ever had. 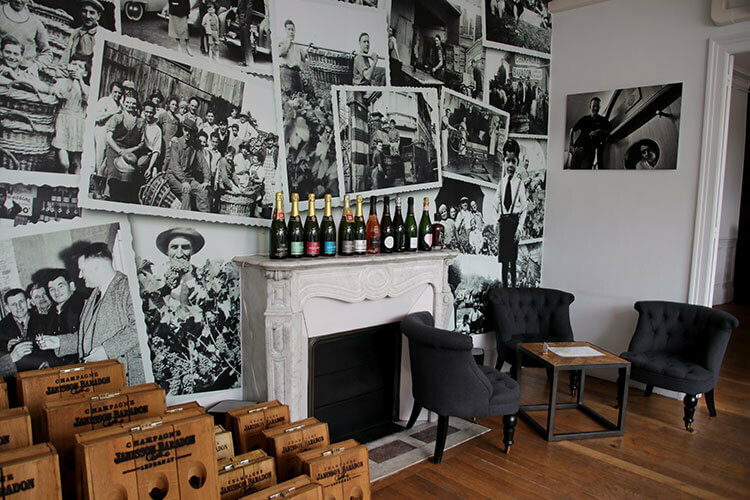 While the biggest champagne houses like Moët & Chandon are certainly impressive to visit, getting this in-depth tour from a family member running their house makes it one of the best champagne houses to visit. Cyril’s hands-on knowledge took the tour to personalized level that you’ll just never get with guides at the most famous houses. Located on the Avenue of Champagne, Moët & Chandon is the world’s largest champagne house and recognized among the best champagne brands. A visit here is a world away from visiting Janisson-Baradon alongside one of its’ owners. Both are fantastic visits, but the contrast is clear between a family-run house producing 80,000 bottles per year and the multinational luxury good conglomerate LVMH (Louis Vuitton Moët Hennessy) owned house producing 28 million bottles per year. Moët & Chandon was founded in 1743 by the Épernay wine trader Claude Moët and at that time began simply as Moët et Cie. The timing of founding the Champagne house was fortuitous in that it coincided with the increased demand for sparkling wine under the reign of Louis XV. Moët’s clientele soon included aristocrats and nobility, catapulting the Champagne house to the top early on. This history is briefly touched on at the beginning of the tour as a guide explains that the house we can see across the street is the original house built and lived in by Moët. The highlight of the Moët & Chandon tour is weaving through the impressive multi-level labyrinth of underground tunnels where centuries of the house’s famous champagne and the vintage Dom Pérignon have been riddled, aged and stored for centuries. In total, there’s a mind-boggling 28 kilometers of tunnels that have been carved out of the white chalk stone of Champagne beneath the house and the famous Avenue of Champagne. The guide explained that unlike Bordeaux or Burgundy, champagne bottles typically do not have years, or vintages as they are known. Instead, skillful champagne producers can blend hundreds of different wines and years in order to create a consistent product. At Moët & Chandon, there’s one exception: Dom Pérignon. It was created as a top product in the 1920s, named for the monk as a nod to his important contributions to champagne making, and it isn’t produced every year. In fact, as of this writing, the last vintage of Dom Pérignon was 2009. Dom Pérignon is arguably the best Moët champagne. It’s always and only a vintage, as the grapes all come from very specific vineyards and singularly from the year of the vintage. 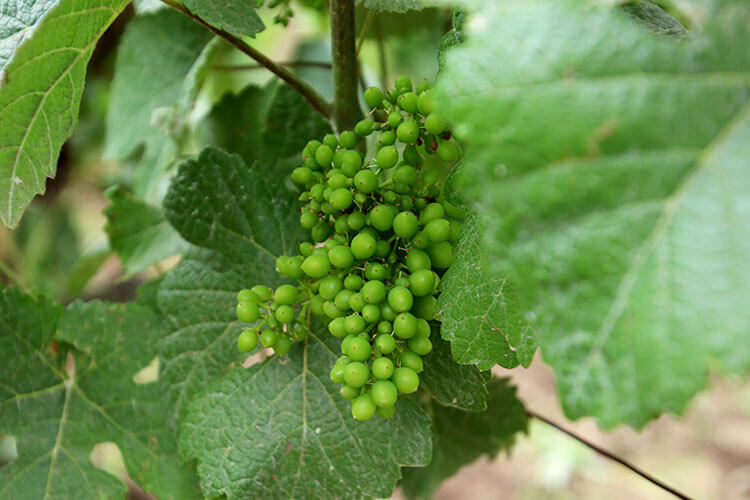 Dom Pérignon also always includes grapes from the original plot at the Abbaye Saint-Pierre d’Hautvillers, which is why it will never qualify as a Grand Cru Champagne. Only champagne made solely from vineyards classified as Grand Cru can be classified as Grand Cru Champagne, and the vineyard at the abbey is classified as Premier Cru. The visit ends with a tasting of Moët Imperial, the house’s iconic champagne and best-selling label that was introduced in 1869. Before boarding the mini bus and officially calling an end to our Paris day trip to Champagne, we walked a bit along the Avenue of Champagne while Hugo pointed out several other champagne houses. 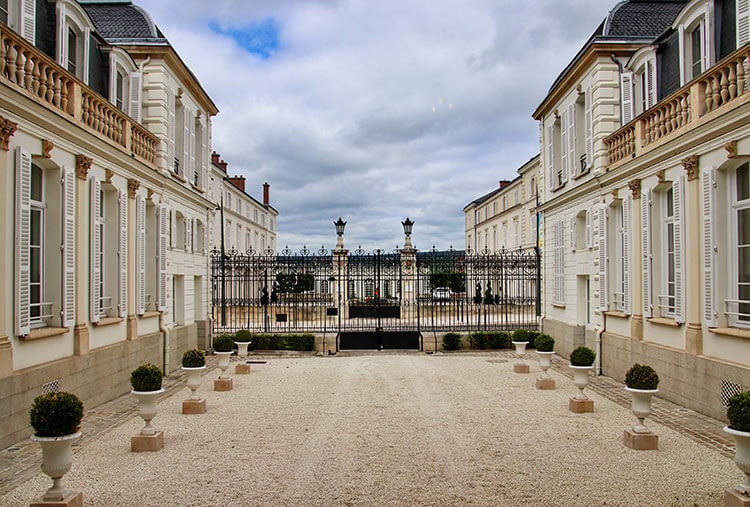 We strolled past houses like Perrier-Jouët, which is only “open to the public” via a virtual tour on their website, before finally collapsing on to bus after a fabulous day spend on what we have no doubt is one of the best Champagne tours from Paris. 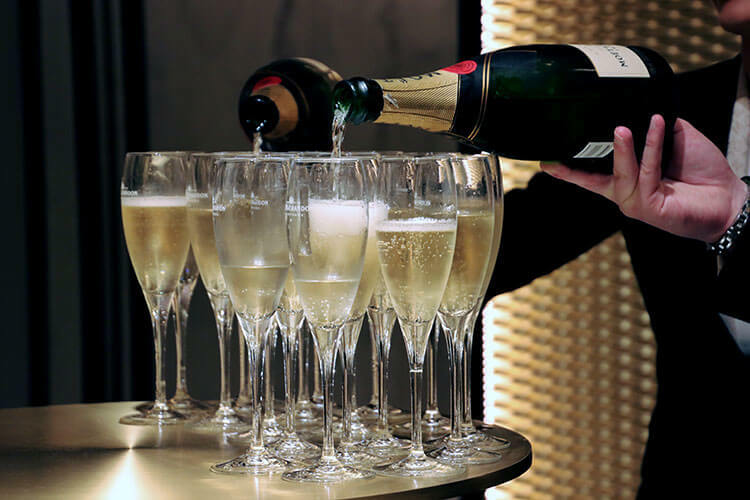 Walks Luxury Small Group Champagne Day Trip from Paris with Moët is around 12 hours and includes comfortable transportation on a mini bus and the visits and tastings at two champagne houses. Lunch is not included, and there are several options the guide can recommend in Epernay. Our day trip to Champagne was in partnership with Walks in order to bring you this story. However, Luxe Adventure Travele maintains full editorial control of the content published on this site. As always, all thoughts, opinions, and enthusiasm for travel are entirely our own. This article contains affiliate links. When you shop on Amazon or book on Walks through our affiliate sites, we earn a small commission at no additional cost to you. Excellent article. You do a great job of explaining why champagne is so special. The unique history you presented makes me desire a glass right now! This sounds fabulous and something that I would love to try on a visit to paris. A quick getaway to the Champagne region to taste the stars! I’m glad you finally got to Champagne! It’s always great to go anywhere with Walks, so I’m sure they did a fantastic job on the tour. Having been to to Champagne at least four times, I highly recommend Epernay if you’re just going for the bubbly, although the houses in Reims are also good. The number of houses so close together in Epernay is awesome, and not just the big ones. I’ve really enjoyed the smaller houses just off the main road. Next time we visit Champagne, we’d love to go to Reims! But this tour was an excellent introduction to the wine region. We have done numerous trips from Paris but could not make it to Champagne. The wine region looks magnificent reminds us of our recent visit to the Lavaux Vineyards in Switzerland. 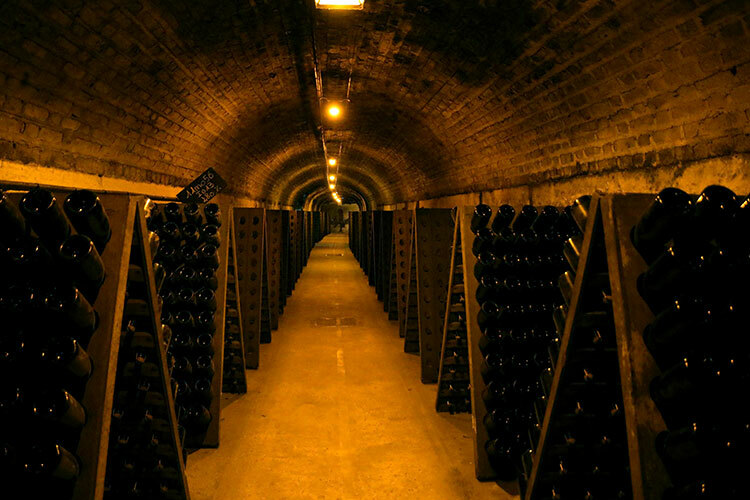 Moet & Chando with 28 kilometers of tunnels is astounding we would love to visit and explore. So is champagne actually made from red grapes? How very interesting. Such a great post – a brilliant read. I’ve been to lots of places in France, but never Champagne. I need to go! Champagne is made from a blend of both red and white grapes. I think of Champagne and I think of a glass of bubbles. I had no idea that Champagne was only an hour from Paris. I didn’t actually realise either that Dom Perignon was a person. I’ve always wanted to have a go at sabrage, but it is just as fun to watch. Moet Imperial was a very befitting end to your discovery of Champagne. 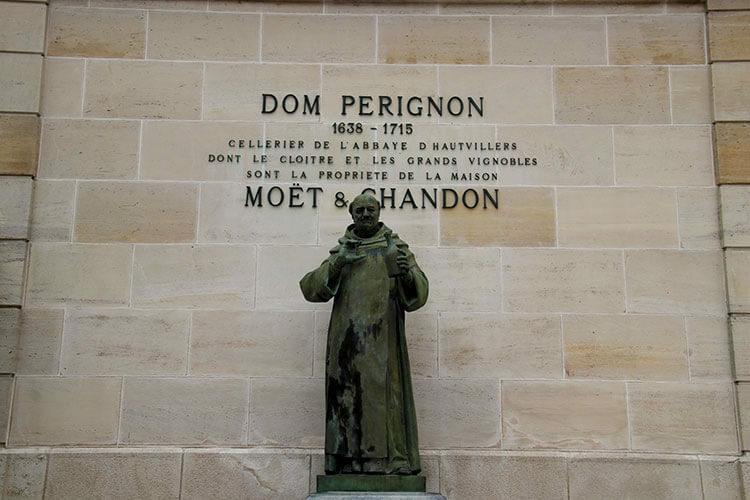 Many people don’t realize that Dom Pérignon was indeed a person! But many of even the most famous labels started as family wineries that got their names from their proprietors. This is a lovely post, full of information that I had absolutely no idea of! Champagne region in France looks pretty awesome and to take a tour with a guide who will give you an insight into the making of champagne and also a background on Dom Perignon is fantastic. Also, I did not know that Champagne is hardly a day trip away from Paris. If I had known this when I travelled to Paris, this day trip would have been on my list! I don’t think most people realize Champagne is so close to Paris. I had no idea you could make this trip in a day and I am kicking myself that we didn’t! I’ll whisper quietly that I think I prefer the taste of prosecco, but I’d love to have Champagne in the region it is produced. I’m another one here that had no idea Dom Perrignon was a person – what a super name, and synonymous now with celebration! This virtual tour of mine bust a huge myth in my head. Did not know about the orgin of the sparkling wine. It was fun traveling through those vineyards with you and in some ways, I got a taste of things . Well narrated and some lovely pics. What a lovely post, Jennifer! It felt like we have been to Paris although we are still planning to go there. The pics are really awesome; it was like reading through a picture book that is well-narrated and really informative. We definitely will try to get our itinerary to Champagne. Thanks for this! I will be driving there via an RV. Am I able to book a tour, starting from the region vs Paris? No, you wouldn’t be able to book this day tour. But you could organize a similar trip yourself. The church of the Abbaye Saint-Pierre d’Hautvillers is open to the public, so you can just go inside. You can book directly at Moët & Chandon for the tour here: https://www.ruedesvignerons.com/fr/domaine/563/champagne-moet-chandon?utm_source=affiliation&utm_medium=luxeadventuretraveler&utm_campaign=moet-chandon and the boutique of Janisson-Baradon et Fils is open to the public. You can have a tasting there.